These cool new toys may deserve a spot in your store - take a look. 2 players compete in this game to help the chicken save her eggs! The farmer has collected the eggs and is ready to cook them. Players wear a plastic chicken beak, and attach a magnetic chicken clamp to their pants. Both players compete at the same time and, without using hands, remove the eggs one-by-one from the frying pan and transport them to the safety of the nest. If an egg falls and breaks, the player must start over. The player that collects the most 'unbroken' eggs in their nest the WINNER. Standard Pump Rockets are a rollicking blast to fire. But our new Bungee Blast Jr ramps up the fun and excitement by an order of magnitude. We've engineered a patented elastic bungee cord inside the pump cylinder to turbo boost the launching power. Load a foam rocket into one end and pull back the cylinder, feeling the increasing tension of the cord inside. Then let go. Kids will be amazed as the stored energy of the cord pushes the piston of air very forceful, blasting the rocket out at hyper-speed. It's like putting a turbo-charger inside! Ages 3 & up. This brand new offering from Boogie Board re-envisions the board as a transparent screen that can be used for tracing anything. 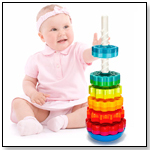 Practice letters, numbers, and shapes, then press a button to clear the design. Spike by R&R GAMES INC.
Weplay® Forever Up-Down by WEE BLOSSOM INC.
Funnybones is part skill, part tradition…and ALL fun! And, with 30 game challenges, the excitement never ends. Funnybones dates to the Greek and Roman periods & now this game is played in many places around the world. Funnybone Toys is thrilled to introduce its special version in the US, with game challenges ranging from easy to difficult! These include Overhand Ones, Twos, Threes and Fours; Clicks; Horses in the Stable; Eggs in the Basket - and more! 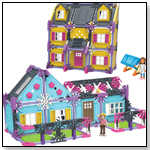 Brief instructional videos of each challenge are posted on Funnybone Toys’ YouTube channel. Players improve hand-eye coordination as they tackle the challenges. Funnybones is great to practice alone and play with others while taking turns. Get ready for Zipperoos! Now a child can enjoy both a portable game and the fun of a plush animal in the same toy. Children can collect more than one Zipperoos game: Monkey’s Wild and Frantic Frog are available now. 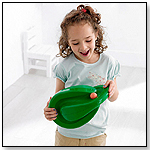 These simple and fun games each come with their own high-quality plush animal carrying case. Each Zipperoos plush has a zippered pouch in its back so children can store their new game inside their animal friend. Or, they can use the pouch as a hiding spot for anything they like! These fun games and furry friends are sure to find a home with any family! •Hello Kitty – a cat on life support? •Should You Decorate Your Retail Store For The Holidays? If So, How?